How does editor draw highlights? When to Use Plugin, Model, Framework? You should use smallworld_product.register_application() to register your applications to the system. There are various examples in the product(s) that are delivered to you. NOTE I have seen where the messages aren't loaded when the application is registered into a running image. The way I have fixed this was calling message_handler(:application_name) before registering the application. It doesn't hurt to leave it there for building images either… Below is an example of a register.magik file. The following section of gui.xml demonstrates how to have a resizable plugins within a tab box. 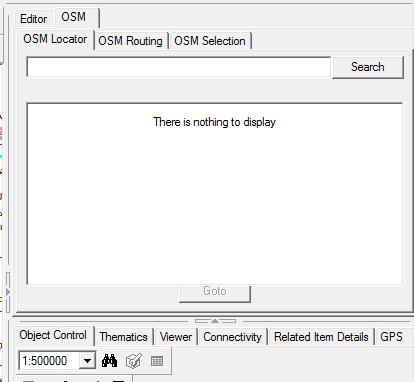 In this example you will see the Editor and OSM are in a "parent" tab box. There are 3 plugins within a child tab box that needed to be resizable. You need a paned_window tag around the tab_box tag in order for the resizing to occur. These appear to control the maximation of the application upon start: application.activate() which calls _self.load_application_settings(). smallworld_product.load_and_save_application_settings can be used to remember last position of the application. You can create plugin GUIs that are created from other plugin GUIs and have similar behavior to modal GUIs. To do this you need to subclass the activate_dialog() method and pass in the parent (could be framework). When you call activate() on the new framework you pass it the parent's top frame like activate(parent.top_frame). See the tutorial for a more detailed explanation. An In Memory Plugin allows you to get access to functionality within a plugin without the need of an owning application or framework. You can easily use <plugin_exemplar>.new(:my_plugin) to initiate the plugin, but it doesn't give you the ability to add XML properties easily. Below is some code that allows you to create an XML file with a single <plugin> element with property elements. # (2016/04/11 - Mark Field (FCSI)): Created. (piEl << xmlDoc.elements).type <> "plugin"
You can create your own unique xml_element tags that helps to define your plugin when simple property values are good enough. To do this you need to create a method on your plugin exemplar called process_initialisation_data_element(xml_element). This will be called when the core plugin definitions do not understand the xml tag. From here you can gather the required data from within the xml_element. These xml elements will be outside <properties> but within <plugin>. You will notice that out of the box functionality shows a Specials pulldown in the object editor. You can easily add functionality to this pulldown list. Create a plugin inheriting from :editor_plugin. Create a method on the object's record exemplar called editor_plugin() that takes editor as the sole argument. There are several ways to build GUIs in Smallworld. You can use the following exemplars to build your GUIs from: model, plugin, and gui_framework. I'm sure there are others too.. But which one is better? As always the answer is not that simple and really depends on your requirements. Below is a brief discussion on each. model This by far is the simplest method of creating GUIs. using the panel object, you can quickly build a gui. You can make the appearance look more user friendly and organized using the rowcol object. This methodology does not really expose any functionality outside the exemplar and is not configurable outside magik coding. There is an engine_model exemplar that gives some foundation to running interrupt-able processes. plugin This was introduced in 3.3 and further enhanced in the 4.x releases. Plugins can be registered with frameworks (or applications). Plugins themselves register "actions" that are designed to be available to other GUIs. So you can include an action from one plugin in another GUI. Plugins can "build/initiate" other GUIs and themselves can be a GUI. There isn't a "standard" engine_plugin to support interrupt-able processes. The GUI functionality is a little more difficult because "place" the actions on your GUI. gui_framework This is the most user customizable GUI. It allows the end user to modify the GUI through config and gui XML files. With flexibility comes complexity. With complexity comes more coding. Graham Garlick at iFactor has developed Dialog Designer which is a very useful tool and helps with the complexities. Also it is a good tool to learn how to implement GUIs from scratch. These are some development tips concerning SWAF and the databus. Typically the databus producers & consumers are added during application initialization based on the shared constants :databus_consumer_data_types and :databus_producer_data_types. But if you are developing a new plugin and forget to add the the producer or consumer types prior to starting the application, you can add thru the magik prompt using the following. You can get access to these gui elements using appl.get_all_gui_elements_with_role(). To turn off the GUI element, use unmanage() to turn them back on, manage(). You can turn on/off 1st level submenu GUI items also, but there isn't a convenient way of accessing them. To get to a button, you can use appl.gui_manager().menus[name][#]. On this button you can use unmanage() and manage().